JERUSALEM – Judah Ben Samuel was a legendary and prolific German rabbi of the 12th century who made some astonishing and specific predictions about the future of Jerusalem and Israel that came true. Judah Ben Samuel, also known as Judah he-Hasid (Judah the Pious), lived and worked from the end of the 12th century until the beginning of the 13th century in Regensburg, authoring a number of books in the German language. Following the Christian crusades to the Holy Land, between 1096-1270, a regular correspondence developed between the Jews in the Holy Land and the Christian West. Thus, for example, the rabbis in Worms and Regensburg in Germany knew that Saladin’s Ayyubids had been ruling in the Holy Land since 1187. He was quite famous in his time as the initiator of the Chassidic Ashkenaz, a movement of Jewish mysticism in Germany. He founded a yeshiva in Regensburg and secured many pupils. Legend has it that, as a young man, he was an excellent bowman but knew little or nothing about daily prayers. But once he got serious about his faith, legend has it that he performed many miracles. It is also reported that he was given a prophecy about the exact year of Israel’s rebirth as a nation and its redemption. So renowned was his work, the Bishop of Salzburg asked him to serve as his personal seer. Because most of his writings were published so long ago – before the invention of the printing press – and in German, few copies have survived. But Schneider has a copy of Judah Ben Samuel’s prophecy about the nation of Israel and the messianic era and has translated the highlights of it into English and other languages for the magazine Israel Today. The prophecy involves the Jubilee Year cycle every 50 years. I should point out there’s much controversy about pinpointing Jubilee Years because they have been observed in Israel since ancient times, while no one is 100 percent certain about when they should occur on the modern Hebrew calendar. However, in the year Judah Ben Samuel died in 1217, he prophesied that the Ottoman Turks would rule over the holy city of Jerusalem for eight Jubilees. Now, keep in mind, he made this prediction 300 years before the Turks seized control of Jerusalem in 1517. 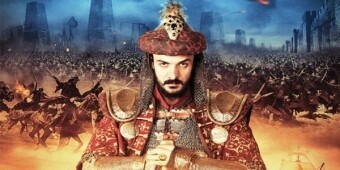 In fact, the Ottoman Empire, as it would become to be known, did not even really exist yet in 1217. According to Judah Ben Samuel, 1217 was a Jubilee Year. If he was right, that would also make 1517 a Jubilee Year. Exactly 400 years after the Ottoman Turks took control of Jerusalem in 1517, they were driven out of the city and the Holy Land in 1917 by the Allied forces under the command of Gen. George Allenby – on Hanukkah, by the way. The rabbi also prophesied that during the ninth Jubilee Jerusalem would be a “no-man’s land.” This is exactly what happened from 1917 to 1967, due to the fact that the Holy Land was placed under British Mandate in 1917 by the League of Nations and literally “belonged” to no nation. Even after Israel’s war of independence in 1948-49 Jerusalem was still divided by a strip of land running right through the heart of the city, with Jordan controlling the eastern part of the city and Israel controlling the western part of the city. That strip of land was considered and even called “no-man’s land” by both the Israelis and the Jordanians. It certainly would be significant if indeed both 1917 and 1967 were Jubilee years considering the significance of what happened in Jerusalem on those years. But it gets better. The rabbi also prophesied that during the 10th Jubilee, Jerusalem would be under the control of the Jews and the Messianic “end times” would begin. The 10th Jubilee began in 1967 and will be concluded in – 2017. What should we expect to happen in 2017? I will leave that to your imagination. But one thing is certain: Judah Ben Samuel made some truly remarkable prophecies that came to pass. We’ll have to wait about four more years to see if his final prediction does as well. What on earth is happening in the Middle East? It seems that all we hear about in the news from this region is another outburst of violence – or a threat of one. In his address at the U.N. last month, Iranian President Mahmoud Ahmadinejad threatened once again to eliminate Israel. Also in a recent speech, he spoke of some Islamic “messiah,” as well as a new world order. As we look at the attacks on our embassies around the world, and specifically the Sept. 11 attack on the U.S. consulate in Benghazi, it is now clear that the war on terror has not been won. When Osama bin Laden was killed, we hoped that might be the end of it. But after Ambassador Chris Stevens and three other Americans, Sean Smith, Glen Doherty and Tyrone Woods, were murdered in Libya, there were people rioting in the streets and burning American flags. As they waited for their close-ups from the American media, they chanted together to the cameras, “Take a picture, Obama! We are all Osama!” That pretty much says it all. The message of Osama bin Laden and the terrorists appears to be alive and well. And what about the so-called Arab Spring? What some thought might be a hopeful sign, perhaps a surge of democracy in the Middle East, has not turned out so well. So what is the explanation of all of this chaos and confusion? What in the world is happening? The short answer is that Bible prophecy is being lived out in real time before our very eyes. The Bible has predicted the things that are happening in this part of the world. Scripture is very clear in pointing out that the end of the world will be centered in the Middle East. And it has all been foretold in the only book that accurately predicts the future: the Bible. Thousands of years ago, Hebrew prophets predicted the Jewish people would be scattered across the earth and then later regathered. Jesus, in fact, gave a very specific prediction when he said the temple in Jerusalem that was being rebuilt by Herod at the time would not only be destroyed, but also would be dismantled, stone by stone (see Matthew 24:1). Did that prediction reach fulfillment? Yes, it did. Because all historians agree that in A.D. 70, Titus and the Roman legions marched into Jerusalem, slaughtered thousands of Jews and dismantled the temple. Why did they dismantle it? Because there was gold in the temple, which had been burned, and they had to dismantle it to extract the melted gold. This fulfilled, to the letter, the prophecy of Christ. Also at this time, the Jews were scattered. Fast-forward many years to the Holocaust, when Hitler sought to eradicate the Jewish people from the face of the earth. Thankfully, the United States, Great Britain and their allies stopped the Nazi war machine. And what happened in the aftermath of the Holocaust was nothing short of amazing. The Jewish people began to return to their homeland. And on May 14, 1948, a modern miracle happened. The state of Israel was officially declared. Here was a nation that had been dispersed for centuries, and then it was regathered. This has never happened again in history. And this was a super-sign that started the prophetic clock ticking. The people of Israel were back in their homeland again. But there was still a problem. Israel did not have control of Jerusalem, and Jerusalem plays a key role in the end-times scenario. Although they had declared their statehood, Jordan was still controlling the old city of Jerusalem, including the Temple Mount and most of the historic sites. Then the Six Day War broke out in 1967, in which Israel was attacked. No one expected her to survive. Not only did Israel survive the attack, but she won the war and gained back a lot of the things she had lost, including the old city. And for the first time in more than 2,000 years, the city of Jerusalem was under Jewish control. Yet to this present day, Jerusalem remains at the heart of the Israeli-Palestinian conflict, with Arab leaders worldwide insisting that Jerusalem and the entire West Bank are rightfully Palestinian territory and ultimately must be given back as a condition of peace. Of course, I am going to side with God on this issue. God gave Jerusalem to Israel. He said to Abraham in Genesis 15:18, “To your descendants I have given this land, from the river of Egypt to the great river, the River Euphrates. …” (NKJV). He gave that land to Israel, and the Israelis are not going to give up the city of Jerusalem. The Bible predicts that the city of Jerusalem will be at the epicenter of it all, and the attention of the planet will be directed toward Israel and toward the city of Jerusalem. Is this happening now? Yes, it is. All of this is happening just as the Bible predicted it would. So let’s go over the chronology of events the Bible has predicted: Israel will be scattered. Has this happened? Yes. Israel will be regathered after her people are scattered. Has this happened? Again, yes. Israel will regain the city of Jerusalem. Has this happened? Yes. Israel will be isolated from the other nations of the world and basically will stand alone. Has that happened? Not quite, but it appears to be moving in that direction. Lastly, Israel will be attacked. Has that happened? Not yet, and not on the scale the Bible predicts. This is still in the future, but perhaps the near future. Scripture specifically tells us that world history, as we know it, will culminate in this part of the world. Some people would assert that it is not important to study Bible prophecy, but I beg to differ. We must study Bible prophecy. The reason we should want to learn about the future is so we will be motivated to live rightly in the present. This is essential to note. The timing of the coming of the Messianic Kingdom of God is placed in the midst of an intense period of great persecution against ‘the saints of the Highest One’. 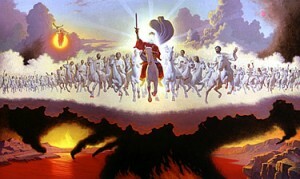 It is not until after this period of great tribulation that the saints then come to possess the Kingdom of God. Among Christian interpreters, there exists disagreement concerning the nature and timing of the stone striking the statue. Those who take the Futurist position understand this event to remain yet in the future. The feet of mixed iron and clay represent a secondary, distinct and final manifestation of the empire or iron—the final Antichrist empire—which will be utterly destroyed when Jesus returns. The stone, of course, represents the second coming of Jesus the Messiah, whose kingdom will then come to dominate the whole world. Alternately, the Preterist interpretation sees the feet of mixed iron and clay to simply be one with the legs of iron. To the preterist, there exists no distinction between the legs of iron and the feet of mixed iron and mixed clay. The stone that strikes the feet represents the first coming of Jesus with his invisible, spiritual kingdom. Preterists would claim that the legs and feet represent the historical Roman Empire, which was conquered by the coming of the invisible Kingdom of God. Today, this spiritual kingdom is spreading throughout the earth. The purpose of this article is to very briefly discuss some of the more obvious failures of the Preterist interpretation of Daniel 2 & 7. Because the Preterist position is unable to satisfactorily account for the clear distinction between the legs of iron and the feet of mixed iron and clay, it is forced to argue that the feet merely represent a particular period within the broader historical Roman Empire. Some argue that the clay intermixed with the iron in the feet represents the mixture of Roman and Jewish-Herodian rule during the first century. This explanation however doesn’t represent the totality of the Roman Empire, but merely one very small segment of the broader empire. Nor does this view satisfactorily account for the sharp distinction between the legs and feet. And so it is seen that only the Futurist position is able to reconcile Daniel’s prophecies with the Book of Revelation’s descriptions, accounting for both the continuity and the division of the last empire. The Preterist interpretation however offers only a strange and forced explanation, which does not sufficiently explain the distinction, nor can it define any period within the Roman Empire when any could say that it ‘was and is not’. It should also be noted that the Preterist position here is forced to understand the seven heads of the Beast to represent specific historical Roman emperors, rather than as historical kingdoms, as is consistent with the motif of ‘mountain’ as found throughout the Bible. While virtually all Preterists attempt to identify the final seventh heads / mountain of Revelation 13 and 17 as referring to some series of historical Roman emperors, it seems as though no two Preterists can agree as to which seven these might be. Virtually every Preterist seems to have a different list of which Roman emperors they believe ‘fit’ the criteria of the prophecy. Futurists however, share general agreement that the seven heads of the beast represent a series of pan-historical, pan-Biblical pagan empires, beginning with Egypt, each which at one time, tried to destroy the Hebrew people and her connection to the promised land. Yet history informs us quite clearly that the Roman Empire never met such a fate. In fact, the fate of the Roman Empire was precisely the exact opposite of the descriptions given within Daniel’s prophecy. Instead of meeting an immediate and decisive blow, the Roman Empire continued to exist and even grow for many years after the coming of Jesus in the first century. The Roman Empire, suffering from internal decay and external attacks, sputtered and crept along for another 1400 years after the coming of the Messiah. History informs us that it was not the influence of the Church that destroyed the Roman Empire, but moral decay within, and pagan forces from without. And all of this, over a very long and drawn out time-frame, at various times, in various places, long after the coming of Jesus. Additionally, it can also be argued that instead of being entirely overwhelmed by the gospel, instead, the Roman Empire essentially incorporated and assumed Christianity into itself, resulting in a significant Roman-pagan influence within the culture, practices, traditions, and even to some measure, the liturgy and doctrines of Christianity. Though I reject the radical views on these matters as argued by Alexander Hislop and many after him, it must be admitted that the exchange between Roman and Christian culture was certainly not entirely one-way. In keeping with the language of the passage, the Futurist interpretation looks forward to the time when Jesus will return to genuinely shatter the pagan governments, and ungodly systems of this world, resulting in the complete and utter victory of the very real and substantial Messianic Kingdom of God filling the whole earth, leaving no remnant of the former pagan influences. The Preterist interpretation of these chapters cannot account for this clear statement concerning the timing of the coming of the Messianic Kingdom of God. When Jesus came the first time, it was not during a time of unparalleled persecution by the Romans against the Jewish peoples, nor did the Kingdom come later during Roman persecution against the Church. The Futurist position, on the other hand, in faithfulness to the text, looks forward to the time when the Messiah will deliver his people from out of a period of overwhelming persecution under the Antichrist, perhaps even in the near future. Another point that few Preterists seem to acknowledge is that unlike the descriptions of the prophecy, the Romans struck and killed Jesus, not the other way around. It will not be until Jesus returns that his victorious judgments will be executed against the pagan governments of the earth. In the perpetual cycle of increasingly frustrating and even outright depressing seasons of political elections, it is heartening to take note of the fact that when the Messiah comes, all corrupt, pagan, and ungodly politicians, governments and unrighteous leaders throughout the earth will be utterly, completely and finally judged and removed. 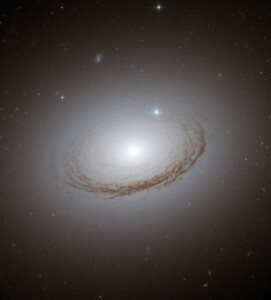 Unlike the vague, partial, and perpetually drawn-out hope that is held-out by the Preterist vision of history (and the future), only Futurism provides us with a vision of the days to come that truly encourages our hearts with the incorruptible hope of a soon coming transition to truly righteous, humble and godly leadership throughout the whole earth. Maranatha!“ Source – Joel’s Trumpet. In several previous articles, I’ve set forth various reasons why we should recognize “Gog” of Ezekiel 38,39 to be one and the same with the Antichrist/Beast of other antichristic prophecies. I have also addressed and dispelled some of the most common arguments against this view. In this article, I will detail yet another significant reason why Gog must be the Antichrist and why the Battle of Gog of Magog can only conclude at the return of Jesus. In another famous end time passage, we see the same pattern again repeated. The LORD promises to gather the surrounding gentile nations against Jerusalem. And once again, he responds with a personal visit and a great earthquake. So we see that the themes of invading hordes, a corresponding great earthquake and a divine deliverance of the people of Israel are commonly repeated themes among these passages that speak of the return of Jesus. It might be quite logical then, to assume that because Ezekiel’s oracle perfectly mirrors all of these elements, it is also speaking of the return of Jesus. Many argue however, that Ezekiel’s invasion, the mighty earthquake, and the accompanying deliverance, precede these other passages by several years. How can Jesus tell people to flee to mountains which, according to the popular view, no longer even exist? If Ezekiel’s prophecy is to have happened a few, or even several years prior, resulting in the mountains of Israel all falling down, how can Jesus still be speaking of near-by mountains, and telling his people to flee to them? For students of the Scriptures who take the words of the Bible literally, there are really only two options; either Ezekiel’s earthquake comes sometime after the middle of the tribulation, or Jesus didn’t know what He was talking about. I’m going with Ezekiel’s earthquake taking place at the conclusion of the tribulation. In the timeline above, the Battle of Gog of Magog concludes either just before or just after the beginning of the final seven years. The problem with this view should be clear. At the conclusion of the Battle of Gog of Magog, there is a massive earthquake whereby all of the mountains will be “thrown down” or “fall down”. If this is the case, how then could Jesus warn the inhabitants of Jerusalem, several years later, to flee to the mountains? This would be impossible. And how could another earthquake level the mountains a second time during the “great earthquake” that takes place at the return of Jesus? Obviously, the popular view has an insurmountable contradiction with Scripture on this point. Now consider the alternative consistent view. Here, we see that because Gog of Magog and the Battle of Armageddon are seen as concluding at the same time, at the return of Jesus, there is no contradiction concerning the mountains being leveled. Neither is there any contradiction with the commandment of Jesus to flee to the mountains at the mid-point of the tribulation. The conclusion is simple. Ezekiel was simply speaking of the same invasion, great earthquake and divine intervention that all of the other prophets were speaking of. Divorcing Ezekiel’s prophesied invasion from Isaiah’s, Zechariah’s and John the Apostle’s prophesied invasion simply cannot be reconciled with Scripture. The Book of Revelation, chapter 19, contains what is perhaps the most famous Biblical passage concerning the return of Jesus. There, Jesus the Messiah is seen to burst forth from heaven, riding on a white horse with the armies of heaven following Him. But as powerful and as well known as this prophetic portrayal of the return of Jesus is, few are aware of the fact that the prophecy of Ezekiel 38 and 39, most often known as the Battle of Gog of Magog, also concludes with the return of Jesus. In fact, it can be said that Ezekiel 38 and 39 is in fact, the Armageddon of the Old Testament. Although many popular interpreters have wrongly understood this passage to conclude several years before the return of Jesus, any honest assessment of the text simply does not allow for this. But among the many reasons to reject a pre-Day of the LORD conclusion of this prophecy, one of the simplest, is because it concludes with the LORD actually physically present in the land of Israel. According to this text, the Lord Himself says that throughout the earth, both people and animals will “quake at [His] presence.” The word used for presence here is the Hebrew word paneh. Paneh is a reference to the actual face of someone or something. When God says that the people of the earth will quake at His paneh, He is saying that they will be terrified because of His actual physical presence, on the ground, in the land of Israel (see also: Zechariah 14:2-5, Isaiah 29:2-8, Revelation 16:16-20). It is also interesting to note that in place of the Hebrew paneh, the Septuagint used the Greek word prosopon. Prosopon is one of two words commonly used in the New Testament to refer to actual presence. The other word is parousia, which is commonly associated with the Second Coming. To convey actual presence, between parousia and prosopon, prosopon is the more powerful term. While parousia most often implies coming, prosopon implies actual face-to-face presence. As Jesus is coming on the clouds, this is His parousia, but once He has actually arrived, then the word prosopon is used. Ezekiel’s description of people quaking in fear of God’s face reveals that at the conclusion of the Battle of Gog and Magog, Jesus the Messiah, God incarnate, is physically present on the earth, in the land of Israel. This is the only time that the phrase “the LORD, the Holy One in Israel” is used in the whole Bible. It is the Hebrew YHVH qadowsh baYisra’el. A similar phrase, “the Holy One of Israel” (qadowsh Yisra’el), is used thirty-one times in Scripture (e.g., Isaiah 12:6; 43:3; 55:5; 60:9, etc.). But here in Ezekiel, the Lord is not merely the Holy One of Israel; He is actually present in the land and on the ground! While the popular position holds that this passage concludes several years before the return of Jesus, this verse makes this an absolute impossibility. Hunt’s observations are correct. But while most conservative, premillennialist, futurist interpreters who take Scripture at face value and use a literalist heremeutic will interpret the entirety of this passage in a literal fashion, when it comes to these two texts which show that God is actually present and in the land, many suddenly switch to an allegorical and non-literalist interpretation, without any justification for doing so. If one uses a consistent literal method to interpret Ezekiel 38 and 39, then one must acknowledge that it concludes with the return of Jesus the Messiah. And as I have said before, if this is the case, within the world of Biblical prophecy, this absolutely changes everything. It is high time for the Church to begin wrestling with the implications. Magog and the Scythians are one and the same. The Scythians lived in Russia. Gog, the leader of Ezekiel’s invasion, comes from Magog. Thus Ezekiel’s prophesied invasion is led by a leader from Russia. The problem with this line of reasoning is that history tells us that the Scythians were a nomadic migratory people who rarely stayed in one place for very long. The question is not if the Scythians ever lived in the region that has become modern-day Russia, but rather, where did the Magog/Scythian people live specifically in Ezekiel’s day? We are not concerned with where the Scythians lived several hundred or even thousands of years after Ezekiel. Our only concern is to discover where they lived during Ezekiel’s day. Lets review a small sampling of historical sources to see where they placed the Magog/Scythian people during Ezekiel’s day. Herodotus, the Greek historian, lived roughly 150 years after Ezekiel. In his day, he placed the homeland of the Scythians in the region extending from eastern Europe to Moldova and the Ukraine. According to Dr. Michael Kulikowski, department head of History at Pennsylvania State University, ‘Herodotus’ Scythians were to be found in a bit of modern Bulgaria and Romania, and across the grasslands of Moldova and Ukraine’ but not Russia. Another essential point is that while Herodotus also discusses Meshech and Tubal, two of the regions that Magog is ruler over, and placed them squarely in Anatolia (modern-day Turkey). Pliny the Elder, a first-century Roman military commander, author, naturalist and philosopher, referred to the Turkish city of Hieropolis as the heartland of Magog. Hierapolis was an ancient Greco-Roman city in Phyrgia near Laodicea. Hieropolis was also known as Scythopolis, (City of Scythes) which the peoples of that day referred to as Magog. One would think that this would be crucial information to consider and mention, yet in the numerous popular books and treatments of Gog and Magog I’ve reviewed in my studies, I have never once seen this important historical reference cited. Roughly a hundred years after Pliny, Hippolytus, one of the most important Christian theologians of the early third century, spoke of Magog. In his work known as ‘The Chronicon,’ Hippolytus also connected Magog to Asia Minor – modern-day Turkey. One would also think this to be a crucial reference to cite. Hippolytus is one of the most prolific early Christian writers concerning the last days. Yet again, in the many popular works arguing for a Russian Magog correlation, I have never once seen it mentioned. Maimonides, also known as Rambam, the revered Jewish sage, in ‘Hichot Terumot,’ also identified Magog as being in the modern nation of Turkey. Magog is, at least, part of Scythia, and comprehends Syria, in which was Hierapolis taken by the Scythians, and called of them Scythopolis. It is that country, which now is in subjection to the Turks, and may be extended thro’ Asia minor, the countries of Sarmatia, and many others, under more than one in succession of time. And in the last time under some one active and daring prince, all their power will be stirred up against Christians. It is because of this fact, ignored by virtually all modern-day popular prophecy teachers, that the homeland of the Scythians during Ezekiel’s day was in western Asia Minor, that so many modern scholar place Magog in Asia Minor or specifically in the ancient Kingdom of Lydia (Western Turkey). In a previous article, I re-created maps from several of the best modern-day Bible atlases, showing how they each placed Magog in the region of modern-day Turkey. 8th century B.C. : Scythians migrate south out of the Caucasus. 7th century B.C. : Scythians invade Asia Minor. 7th century B.C. (in Ezekiel’s day), Scythians founded Scythopolis near Laodicea. Late 6th century B.C. : Scythians driven into Europe by the Persians. 4th-3rd centuries B.C. : Scythians spread north to European and Russian Steppes. Through consulting a wide range of ancient sources, including Assyrian records, scholars today acknowledge that before Ezekiel’s day, the Scythians had pushed down out of the Caucasus and invaded Asia Minor, or modern-day Turkey. There they dominated and settled the city of Hierapolis, also known as Scythopolis, in the western Anatolian Kingdom of Lydia, which was for many years known as Magog. Sometime after Ezekiel’s day, a Persian invasion pushed the Scythians out of Asia Minor, west and north into Europe around the Black Sea. Eventually they would reach Russia. But this was hundreds of years after Ezekiel’s day. In conclusion, Ezekiel spoke of a Turkish-led invasion of Israel. Genuine students of the Scriptures who make it their goal to always seek truth, even when it is in conflict with their own traditions, will recognize the flaws with this view. It is imperative that students of the Bible take the time to study Ezekiel’s prophecy. In my newest book, ‘Mideast Beast: The Scriptural Case for an Islamic Antichrist,’ not only do we examine many essential, but often-ignored historical, geographical and exegetical elements of the passage, but even more importantly, its application and relevance for the Church and the world today. As the days the prophets warned us of draw ever closer, it is imperative that every Christian believer pay careful attention to the roadmap and many prophetic warnings so clearly laid out before us. The Lord has given us this roadmap; it is our duty as his students of the Scriptures not only to make ourselves aware of it, but most importantly, to follow it.” Source – WND. All of the nations of Ezekiel’s Gog oracle are destroyed. Is Ethiopia thus destined to be decimated by God? Far from it. The truth is that the modern-day nation of Ethiopia is largely unrelated to the Ethiopia mentioned by Ezekiel. The translation of ‘Cush’ as ‘Ethiopia’ is actually quite misleading. Yet as a result of this widely used, but faulty translation, the poor Ethiopian people today, one of the most ancient, noble and largely Christian cultures in the earth, have gotten a seriously bad rap. How did this confusion come about? The Hebrew word translated as Ethiopia is ‘Cush.’ Cush was the son of Ham and grandson of Noah. Many of Cush’s descendants settled in the region of southern Egypt, from Aswan to the place where the Nile River meets the Blue and White Nile rivers. The confusion comes from the historical name swap between Ethiopia and Abyssinia. The region the Bible refers to as Cush became known as Nubia, which the Greeks called Aithiopia. But today this region is southern Egypt and Northern Sudan. On the other hand, the ancient region of Abyssinia was much more southeast. This is where modern Ethiopia is now located. In others words, ancient Abyssinia is modern Ethiopia and ancient Aithiopia is modern-day North Sudan. Because of this confusion, many students of prophecy are awaiting the Christian majority nation of Ethiopia to join with the Islamic alliance described in Ezekiel 38 and 39 [ICA: See related article here]. But a correct understanding of the name Cush points us to North Sudan, not Ethiopia. Modern Day North Sudan, South Sudan, Ethiopia and surrounding nations. 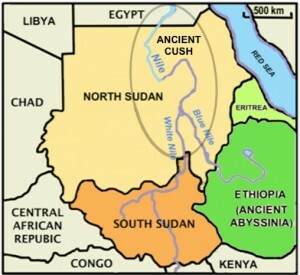 The grey oval around the three Nile rivers represents ancient Cush, which most Bibles translate as “Ethiopia.” The Green nations of Ethiopia and Eritrea were called Abyssinia in ancient times and do not correlate to the biblical Cush. But the judgment prophecies of Ezekiel concerning Cush/Ethiopia do not merely point us to the Sudan in general, but specifically North Sudan. From the perspective of biblical prophecy, this is all very significant. The recent cessation of South Sudan is a significant development, bringing greater clarity to Ezekiel’s prophecies. 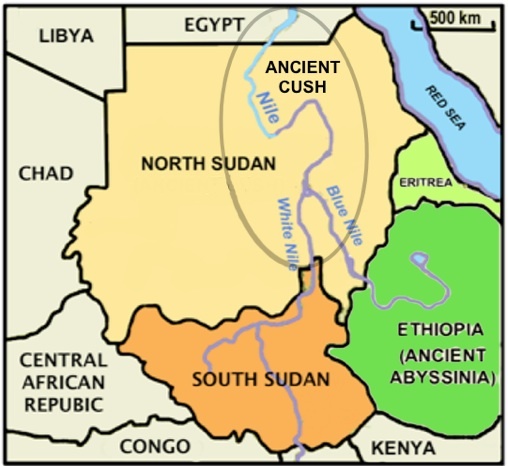 The biblical region of Cush was centered at Meroe where the Nile river meets the White Nile and the Blue Nile, roughly 75 miles northeast of the city of Khartoum, the capital city of North Sudan. Today, an ideological and military Islamist alliance is already forming against Israel, which includes the Islamic nation of North Sudan and Libya. These two nations represent the southern branch of Ezekiel’s Gog alliance. But while North Sudan is well-known as an Islamist stronghold, South Sudan has a significant Christian population. And beyond having a large Christian population, like Ethiopia, South Sudan also has a large number of believers whose faith has many distinctly Messianic-Jewish characteristics. Many of these Christian groups trace their roots back to the early Messianic Jewish communities. And many of these Messianic believers are also supporters of Israel who would have no part in an invasion of the Jewish state. While this may seem a bit academic, there are actually a few essential lessons here. First, it is imperative to accurately understand what nations and regions the ancient names in Scripture are pointing us to. Beyond this, an accurate understanding of what the prophets are actually saying helps the church as we seek to join with the Lord’s purposes. Understanding these prophecies will help Christians determine where to allocate their time, resources, energy and money. Where we direct our intercessory prayers and which missionaries and ministries we choose to support should all be influenced by what we believe the Lord is doing today in the earth. It is imperative that the church aligns its purposes with what the Lord is doing in the earth now. Today the new nation of South Sudan is deeply in need of prayer, rebuilding and overcoming the effects of war. Beyond this, the ravaging effects of decades of United Nations miseducation has devastated families and actually ruined the faith of tens of thousands. Meanwhile, both South Sudan and Ethiopia are at the front lines of the radical Islamic agenda to exterminate the ancient African Christian communities. While some students of prophecy today, due to the outdated and misleading translations found in most Bibles, are simply sitting back waiting for Ethiopia and South Sudan to join a forthcoming anti-Zionist, Islamist invasion of Israel, those who know the truth will understand that now is the moment for the global church to rise up and stand with these beautiful shining gems that are the Christian communities of South Sudan and Ethiopia.” Source – WND. In many churches, those members who study Bible prophecy are relegated to the lunatic fringe or dismissed out-of-hand for wasting their time trying to divine the future. The Bible says that there are other rewards, or crowns, set aside for those that dedicate themselves to Christ in a number of different theological disciplines. The Judgment Seat of Christ is the place where all of the deeds that individuals have done after they have become Christians are revealed and examined to determine whether they be good works or whether they be bad. Let me emphasize that the word “bad” refers not to sin, but to deeds that are worthless according to His purpose. Whether or not they were sin is irrelevant – all sin is forgiven at the Cross — but every deed has consequences. The Bema Seat evaluation, therefore, is based upon whether the works that have been done are worthwhile or whether they are worthless. The Greek word translated as the ‘judgment seat’ of Christ is the Greek word ‘bema’. During the Greek Olympics of Paul’s day, the judge would sit on the ‘Bema Seat’ situated along the finish line. His judgment was to determine who won the gold, who won the silver, who won the bronze, who came in fourth, fifth, etc. Note that the only ones judged at the Bema Seat are those who cross the finish line. The Bema Seat is reserved for believers — those who successfully completed the ‘race’ and specifically to determine their running order and to award their prizes. Unbelievers will be judged at the Great White Throne. Scripture teaches that after these works are judged, rewards will be given if the works are worthy. There will be no rewards if the works were unworthy — but that is not the same thing as being condemned. Salvation is based on whether or not you trust that Jesus Christ made full payment for your sins, as He promised He would. While we will stand before the Judge as judicially ‘righteous’ — that righteousness is Christ’s alone. But it is freely offered to whosoever will accept it by faith. Once we stand before the Bema Seat, our rewards are determined — not our punishment. Our punishment, although richly deserved, has already been borne by our Savior. Now, we are judged according to our works on behalf of the kingdom. I agree. We ought to serve Him because we love Him, but we have every right and reason in the world to strive to warn our rewards. Our rewards are based on our works – but not our salvation. Not everybody will receive the crown of self-denial. Each of us is gifted with certain strengths according to some predetermined purpose of God. In other words, some things are harder for some than they are for others — according to God’s purposes — not our own. We are judged according to how hard we try. There is also the Crown of Rejoicing — the ‘Soul Winner’s Crown’. Notice the word “temptation.” That is a broad word. Sometimes it means a solicitation to evil–that is, you are tempted to commit murder, or you are tempted to commit adultery. It is a solicitation to evil. Sometimes it is a reference to a test that God permits you to go through as a kind of ‘refinement by fire’. ‘Faithful unto death’ is not a condition of salvation — salvation comes by grace through faith in the efficacy of Jesus’ sacrifice for sin at the Cross. Keep in mind that the only ones that will stand before the Bema Seat are ALREADY saved by grace. There is the Crown of Glory — the crown of the ‘undershepherd’ or the ‘pastor’s crown’. Not every pastor or undershepherd will receive this crown, either. There are those who will fail the test of ‘willing service’ or those who set themselves up as ‘lords over God’s heritage’ instead of being examples to their flocks, or those who fail to feed their charges with God’s Word. Finally, there is the Crown of Righteousness. Those who study prophecy, those who dedicate themselves as watchmen on the wall, ready to give the warning of His soon appearing, will receive the Crown of Righteousness from the Righteous Judge at the Bema Seat. Personally, I am not certain that I will receive the crown of self-denial. I am not too sure that I keep my body under control enough to deserve this reward. I am not too sure I will win the soul winner’s crown, although it is one I really, really hope to earn. I am not sure that I will get the Crown of Glory — as an undershepherd, I have many shortcomings. I pray for the Crown of Life for enduring life’s trials — but I am not certain that I have endured them with the long-suffering love of Christ as I should. So I am not sure about that one, either. But I am hopeful of the Crown of Righteousness — it is the easiest one to get. My righteousness is not my own, but that of Christ’s, and my love of His soon appearing is an all-consuming passion. The point to it all is this: We will all one day stand before the Bema Seat — but the Bema Seat is where we are judged for our rewards. Whether or not I receive all — or even any — of the rewards that are available to me as a believer, I have the certain assurance that, even if I suffer loss, I will still enter heaven, even if it is ‘as if by fire’. And so will all those who have trusted Jesus for their salvation. An archaeological scandal stirs Jerusalem this week: Who were the thousands of people whose skeletons were filmed by journalist Benny Liss at the foot of the eastern wall on Temple Mount? Were they victims of a Second Temple-era massacre or simply corpses buried in a Byzantine gravesite? The Gate of Mercy, near the cave in which the skeletal remains were found. Like something out of a horror movie: a still image from Benny Liss’ chilling film. The winter of 1995-6 was a hard one for Jerusalem, particularly for archaeologists. Rabbi David Schmidl and his organization, Atra Kadisha, were terrorizing the Antiquities Authority. In Jaffa, a ritual Pulsa di Nura curse was cast on three Antiquities Authority employees who participated in a salvage excavation — part of the early stages of the construction of the Andromeda Hill housing project — in which many graves had been discovered. In Jerusalem’s Mamilla region archaeologists were still licking their wounds from their battles with the ultra-Orthodox over the burial caves that had been found there. But Amir Drori, the director-general of the Antiquities Authority at the time, was not about to compromise with Schmidl and his team. Maybe that is why, when the Ophel Archaeological Park was about to be built, and the fate of the burial caves on the eastern slopes of the Temple Mount — most of which are from the Byzantine era — had to be decided, the high-ranking personnel of the Antiquities Authority chose one of the coldest, rainiest nights of February to visit the site, and did so only after midnight. In the area that stretches between the eastern wall of the Temple Mount and the channel of Nahal Kidron there is a Muslim cemetery right up against the wall of the Temple Mount. But it was the haredim, not the Muslims, whom the archaeologists feared. The Antiquities Authority officials who visited the slope at the foot of the wall on the Temple Mount that night were Drori (who has since passed away), Gideon Avni (the district archaeologist of Jerusalem) and Boaz Zissu (then the director of the unit in charge of preventing the theft of antiquities). Benny Liss, the archaeological affairs reporter at Channel One, who had close ties with the Antiquities Authority, joined the group. They entered some of the caves that night, along with Liss and a small team. It appears that an agreement had been reached that the reporter would be allowed to tag along solely for documentation purposes, and not for release to the media. Last weekend, three days before the fast of Tisha B’Av, Liss, now retired, dropped an archaeological bombshell. For the first time, at a conference given by Megalim, the City of David Institute for Jerusalem Studies, he showed the footage that he had filmed in those caves that night. Along with the shocking images of skeletons he filmed, came Liss’ own theory, that the skeletons belonged to the 6,000 people who had been killed on the Temple Mount during the destruction of Jerusalem, as described by first-century Jewish historian Flavius Josephus. The audience was in shock. On Sunday, the main points of Liss’ theory were printed on the news pages of Israel Hayom. Since then, the foreign and local media have had Liss’ phone ringing off the hook. I went back to him as well, and together we watched the film again. First, here is a clear, succinct description of the footage. Night. Darkness. Liss holds a flashlight. The cameraman holds a lamp. The lighting is not optimal, but they make do. Liss goes down the stairs into the cave, the photographer following him. The floor of the cave is covered with skeletons, bones and fragments of bones. There is also a bit of carbonized material there. Some of the skeletons are not intact. One is missing a leg. Two of them look like they were laid there in a more orderly manner instead of merely thrown inside. “I wanted to see how deep the bones went. I lay on top of them and put my arm in as far as it would go, until my shoulder was also inside. I didn’t reach the bottom,” he says. The last images in the film are of Liss and his cameraman leaving the cave, breathing heavily and reciting the blessing: “Blessed is He who raises the dead.” Cut. Liss offers a theory, “not a scientific statement,” he says. Unlike the adjacent burial caves, there are no Christian symbols, such as crosses, or accessories or sandals in this cave. The cave, which is near the Golden Gate, was the ideal place for the Romans, who stayed on the Temple Mount for a month after destroying the temple, to bury the thousands of corpses. The corpses could not be removed west of the area of the Western Wall because that was the way to the upper city, which the Romans had not yet occupied. They could not go north because that was the way they had come to conquer the city. Nor could they go south to the built-up area of the Hulda Gate, which was the entrance to the Temple — that was not proper. For the Romans, the caves to the east, near the Golden Gate, which were much lower down at the time, were a natural solution. Liss relies on Josephus’ shocking description of the events and also on the research done by historian Nathan Shor, who documented the literature of travelers to the Land of Israel. Shor’s research cites evidence that Jews were among those buried on the slope that Liss and his associates visited that night. Shor quotes the account of an unnamed Jew, a student of Nahmanides, who wrote about the discovery of Jewish graves on the slope facing the Mount of Olives, at the foot of the city wall. He also quotes a similar account by an Italian monk, Niccolo da Poggibonsi, but relies mostly on the description of the region given by Rabbi Yitzhak ben Meir Latif, who was born in Italy in the second half of the 15th century. 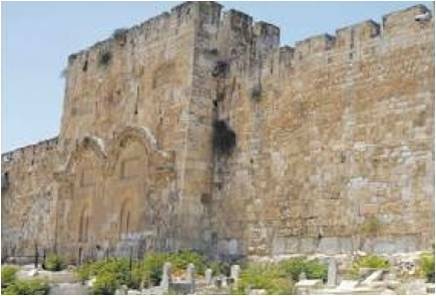 Latif reports that the Muslims took the Jewish cemetery beside the Golden Gate from the Jewish community and pushed the Jews to the lower slope that was closest to the Mount of Olives. Dr. Dotan Goren of Bar-Ilan University, who documented the Jewish efforts to buy land in the holy sites in Jerusalem and its environs during the Ottoman era, gathered quite a few accounts of ancient Jewish burial sites there. Liss believes that the cemetery that was taken from the Jews was the continuation of the Jewish settlement that existed there and of the disorderly burial that the Romans gave the Jews who had been killed during the destruction. The big problem for Liss, and also for the archaeologists with whom we spoke this week, is that the burial cave was never sampled. The bones and any other findings that may be there were never dated. The cave was sealed by officials of the Antiquities Authority as quickly as it had been opened because the people in charge of the Ophel promenade project had promised that the caves would not be disturbed during the construction of the promenade and the improvement of the road nearby. The attempt to retrace earlier archaeological excavations did not help to solve the mystery either. In 1869, Charles Warren, the well-known archaeologist, excavated, by means of shafts and tunnels, the lower portion of the eastern wall of the Temple Mount. Robert Hamilton, the British archaeologist, dug there in 1935 and discovered graves from the Byzantine era. In 1995, Ronny Reich and Eli Shukron excavated as part of the development of the Ophel road. Their dig uncovered findings that hint at dwellings, evidently Jewish ones, that existed in the area in Second Temple times. It also documented about 25 Byzantine burial caves along the length of the eastern slope. Even the many renowned Israeli archaeologists whom we contacted kept their statements vague. They all spoke of the need to take samples from the cave before drawing any conclusions, and said that the footage was not enough. Professor Dan Bahat raised the possibility that the skeletons could be the remains of Christians massacred by the Persians in 614 C.E. Dr. Gabriel Barkai mentioned Muslim group burials in the area. Hillel Geva, the director of the Israel Exploration Society and the archaeologist of the Company for the Reconstruction and Development of the Jewish Quarter, mentioned the possibility that the remains might belong to victims of an earthquake or an epidemic. He also mentioned the massacre of the Christians by the Persians. Everybody said that all options were open, including the option that Liss mentioned. But Liss found himself in an impossible situation this week. Everyone wanted to know what had brought him to the cave, and he told a different story to each person who asked him. He wanted to protect his sources. That is, until I reached Boaz Zissu, then an employee of the Antiquities Authority and now Professor Boaz Zissu of the Department of Land of Israel Studies and Archaeology at Bar-Ilan University. He also co-wrote, together with Professor Amos Kloner, a book titled “The Necropolis of Jerusalem in the Second Temple Period.” Zissu was able to shed some light on the mystery for me. “I was there that night,” he said. “Even though I didn’t go inside the cave that Liss and his crew documented, I went into one that was nearby. With us in there were people from the Antiquities Authority, including the late director-general, Amir Drori, the district archaeologist, Gideon Avni, and others. After studying still photographs from Liss’ film and comparing them to other photographs from that night, Zissu said that Liss’ film showed that the cave was a Byzantine burial site. Which cave are we talking about? But the last word in this mystery-filled debate has not yet been uttered. Liss insists that the cave that he documented was higher up, near the wall. Zissu is talking about a few meters above the road, much lower down. Liss insists that in the cave he filmed there were no Christian symbols. Also, it was not a hewn cave but rather a natural one, unlike the nearby caves that he documented, which were lower down. He also mentions the carbon remnants, which he says may hint that the skeletons do in fact belong to the victims of the massacre on the Temple Mount, and bones with cuts or other kinds of damage that could be evidence of wounds sustained in battle. Officials of the Antiquities Authority say that they know nothing of this issue and would be happy to receive information from Liss about it. One of Avni’s successors at the Antiquities Authority says that he heard about a large burial cave in the region that has never been investigated. One way or another, the chances that the cave that Liss documented, with its thousands of skeletons, will be opened anytime soon, are slim. The cave is below the Muslim cemetery, which spreads out over a large area below the eastern wall of the Temple Mount. Only recently, the Temple Mount Rescue Committee won its battle to prevent the cemetery’s expansion southward, into uninhabited areas. The Muslims will firmly oppose anyone who dares to approach their territory to try to solve the mystery, so Schmidl and his colleagues in Atra Kadisha can relax. The story also shows us how little we know about Jerusalem in ancient times. It also shows the major archaeological role that the Temple Mount itself, which has never been excavated due to Muslim opposition, could play in drawing up a more precise map of Jerusalem’s past.